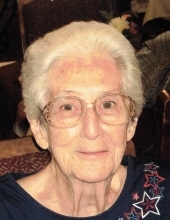 Helen Marie (Brugh) Hollett, born March 19, 1924, in Plymouth, Indiana passed away on March 31, 2019. She was the daughter of Fred E and Etta Jane (Berkeypile) Brugh. Helen was preceded in death by her parents and sisters, Myrtle J McGonegal, Goldie M Brugh, Hazel I Travis, and brother, John Frederick Brugh. On July 13, 1941, Helen married Scott J. Hollett Sr., they were married for 62 years. Prior to her marriage Helen worked for the Marshall County Jail and the Plymouth Public Library. As a girl, she wanted to read every book in the library. She continued reading voraciously, doing crossword puzzles, and playing Scrabble with friends all her life. As a woman, she raised five wonderful children and helped build and run a very successful family business, Scotty’s Hydraulic Service. She worked in the family business from the onset in 1956 through 1993. Helen lived in Plymouth until she retired in 1993. Then Scott and Helen moved to their home on beautiful Lake Wawasee, in Syracuse, Indiana. She enjoyed many of her retirement years on the lake, playing golf, and traveling to the warmer states in the winter months. After Scott’s death in 2003 Helen returned to Plymouth and made her residence at Miller’s Assisted Living. Surviving are her sons Scott J (Martha) Hollett II (South Bend) and their children, Ray (Melanie), Steve (Lorie), Phil (Hiromi), and Diana (Tom) Harley. Jeffrey Hollett and children, Theodore, Pamela Claypoole, and Thomas (Colleen). Bruce H Hollett (Melody) and their children Bruce Brian (Laurie) and Etta Sammartano. Frederick R Hollett (Julianne) and their children, Jennifer (Kent) Stevenson, Jason, Rachael (Chad) Eyrich, Benjamin (Emi), and Alexandria. Georgia S (Susie) Shez, and children, Electra Fasching, Angelique Weidner, Poaolo Palmitessa, Nicola Palmitessa, and Zachary Shez. Also, her very special Daughter-in-law Glenda Anderson. and 25 great-great grandchildren. She enjoyed face-time, pictures and videos of all her grandchildren, great-grandchildren and great-great grandchildren. She had a total of 88 descendents. She was preceded in death by her husband, Scott J Hollett Sr., son, Jeffrey Lynn Hollett, daughter-in-law, Alice C Hollett, granddaughter, Debra Lynn Hollett, great-grandson, Jacob Hollett and great-granddaughter, Victoria Marie Palmitessa. The family will recieve friends at Deaton-Clemens VanGilder Funeral Home, 300 W. Madison St. Plymouth, IN 46563 on Friday, April 5th, 4:00-7:00 PM and on Saturday, April 6th, 10:00-11:00 AM with funeral services following at 11:00 AM with Pastor Ruth Yoder officiating. Burial will follow in New Oak Hill Cemetery. Memorials may be offered to the Plymouth Public Library, Celbrate Recovery or Heartland Hospice. To send flowers or a remembrance gift to the family of Helen Marie (Brugh) Hollett, please visit our Tribute Store. "Email Address" would like to share the life celebration of Helen Marie (Brugh) Hollett. Click on the "link" to go to share a favorite memory or leave a condolence message for the family.